Exercise 19: Sample Size. 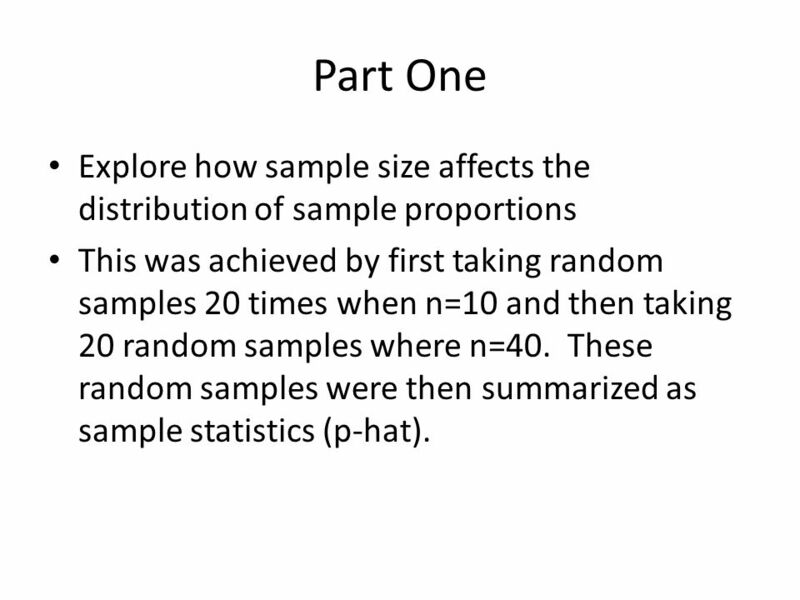 Part One Explore how sample size affects the distribution of sample proportions This was achieved by first taking random samples. 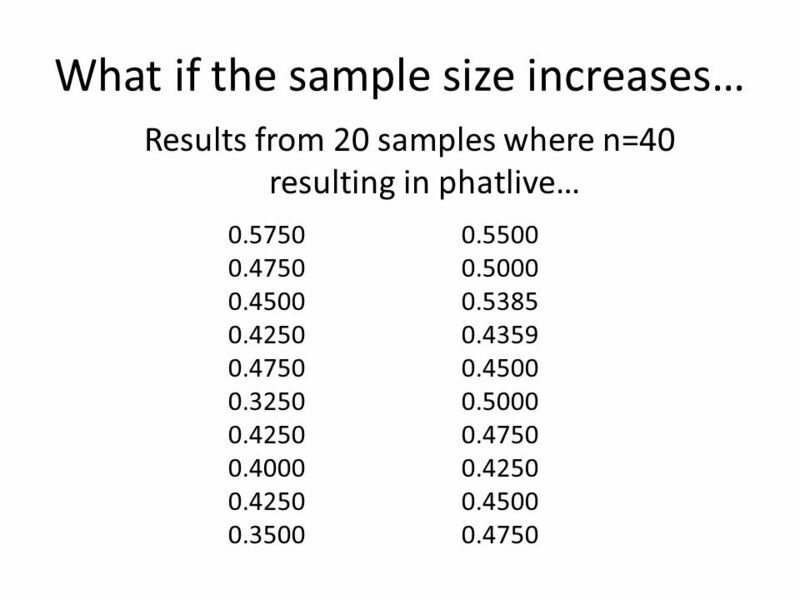 2 Part One Explore how sample size affects the distribution of sample proportions This was achieved by first taking random samples 20 times when n=10 and then taking 20 random samples where n=40. 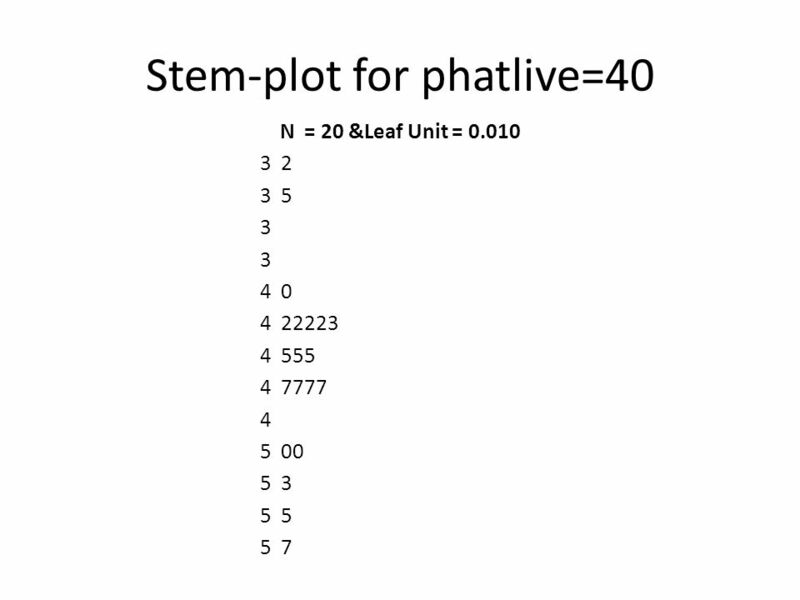 These random samples were then summarized as sample statistics (p-hat). 3 Tally for Discrete Variable : Live Live Count Percent off 223 50.11 on 222 49.89 N= 445 *= 1 This verifies that the proportion of students living on campus and off campus is approximately 50%. This would be the population proportion (p). 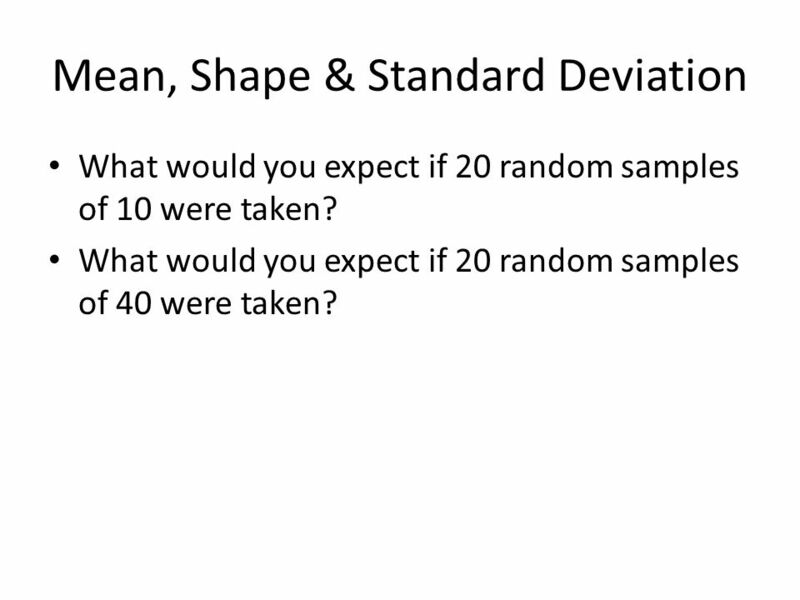 4 Mean, Shape & Standard Deviation What would you expect if 20 random samples of 10 were taken? What would you expect if 20 random samples of 40 were taken? 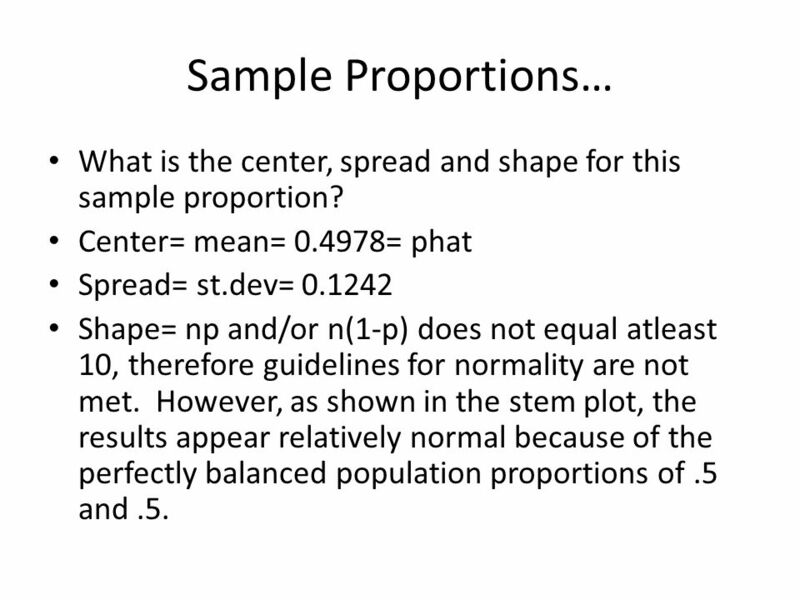 8 Sample Proportions… What is the center, spread and shape for this sample proportion? 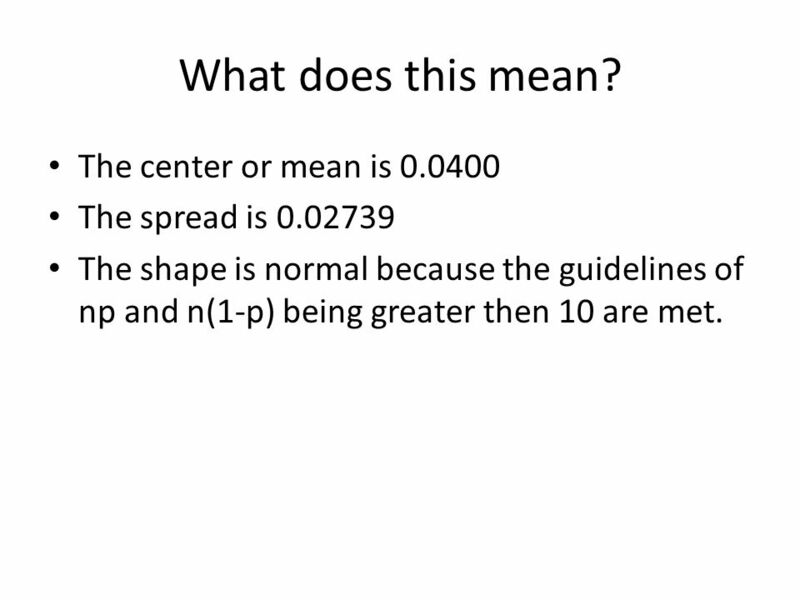 Center= mean= 0.4978= phat Spread= st.dev= 0.1242 Shape= np and/or n(1-p) does not equal atleast 10, therefore guidelines for normality are not met. 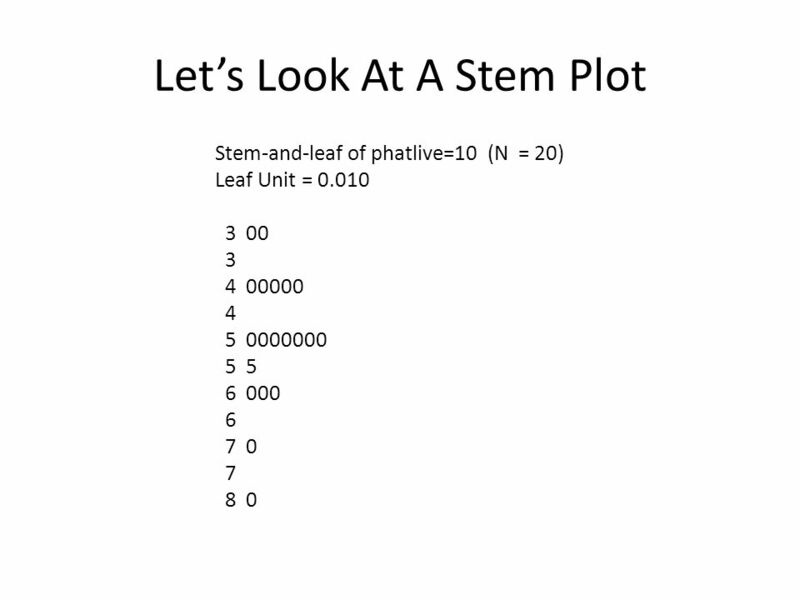 However, as shown in the stem plot, the results appear relatively normal because of the perfectly balanced population proportions of.5 and.5. 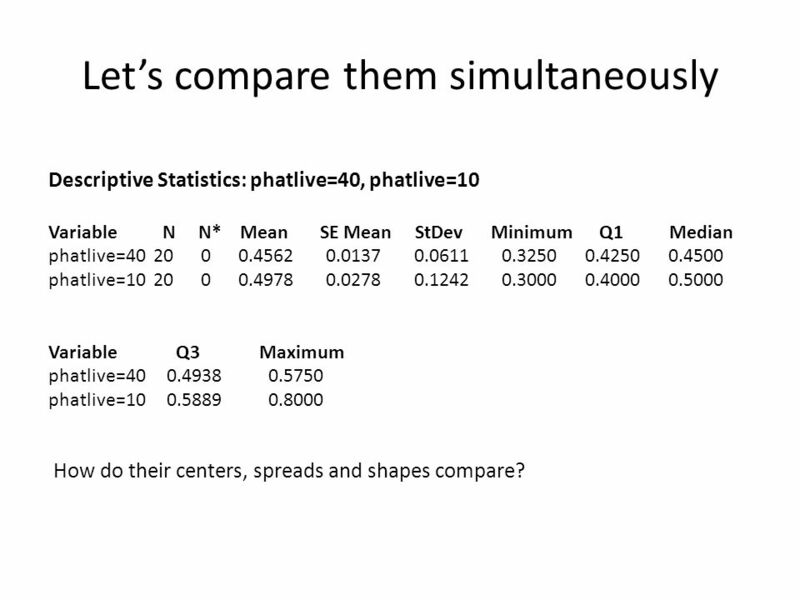 12 Sample Proportions for phatlive=40 What is the center, spread and shape for this sample proportion? Center= mean=.4562 Spread= st. dev. 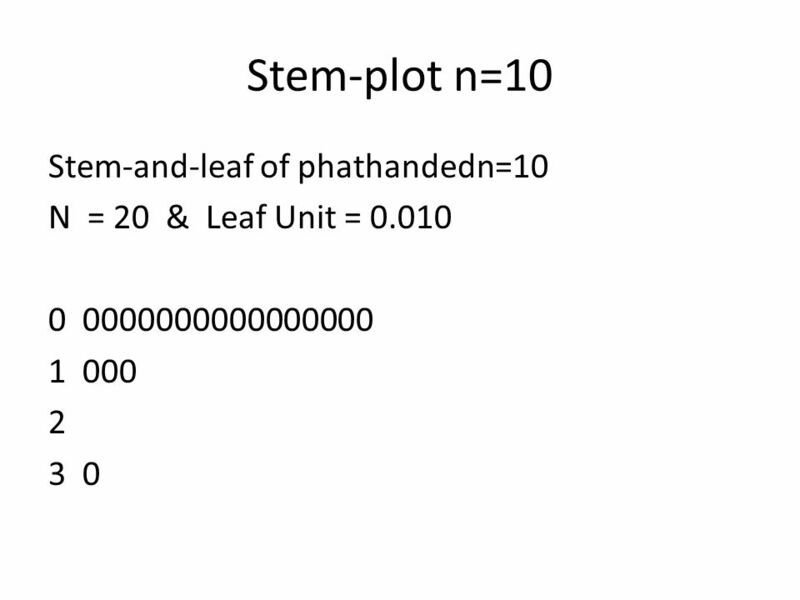 =.0611 Shape= np and n(1-p) are greater then 10 there normality satisfied. 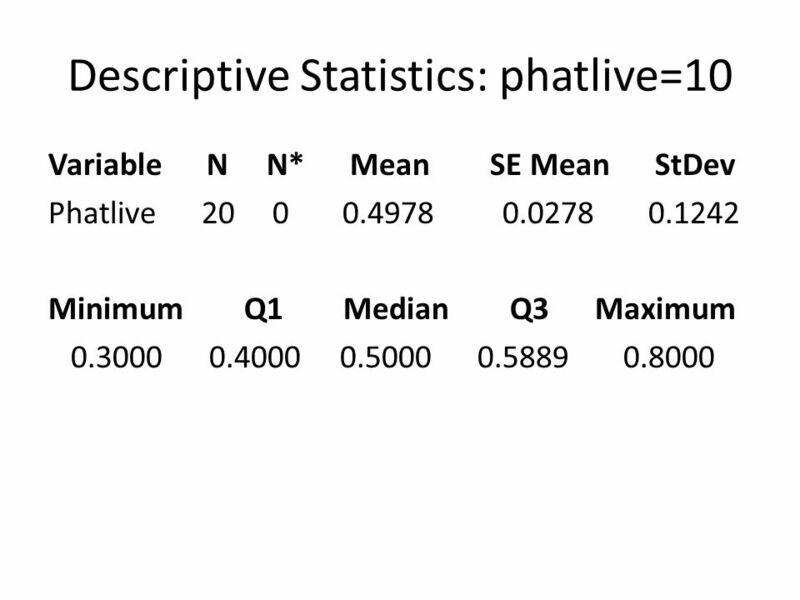 13 Let’s compare them simultaneously Descriptive Statistics: phatlive=40, phatlive=10 Variable N N* Mean SE Mean StDev Minimum Q1 Median phatlive=40 20 0 0.4562 0.0137 0.0611 0.3250 0.4250 0.4500 phatlive=10 20 0 0.4978 0.0278 0.1242 0.3000 0.4000 0.5000 Variable Q3 Maximum phatlive=40 0.4938 0.5750 phatlive=10 0.5889 0.8000 How do their centers, spreads and shapes compare? 16 As outlined in Chapter 6 A random variable X for count of sampled individuals in the category of interest is binomial with parameters n and p if… 1.There is a fixed sample size n 2.Each selection is independent of the others 3.Each individual sampled takes just two possible values 4.The Probability of each individual falling in the category of interest is always p.
17 However… The second condition isn’t really met when sampling without replacement. 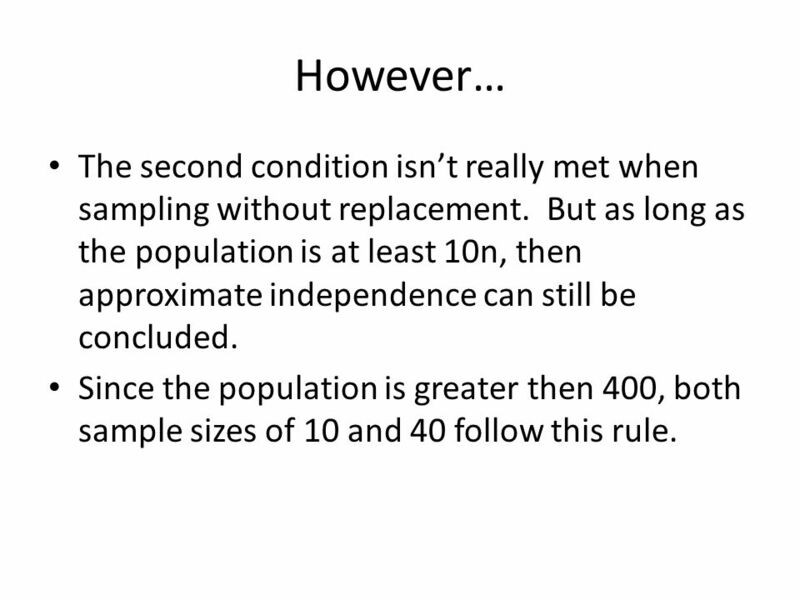 But as long as the population is at least 10n, then approximate independence can still be concluded. Since the population is greater then 400, both sample sizes of 10 and 40 follow this rule. 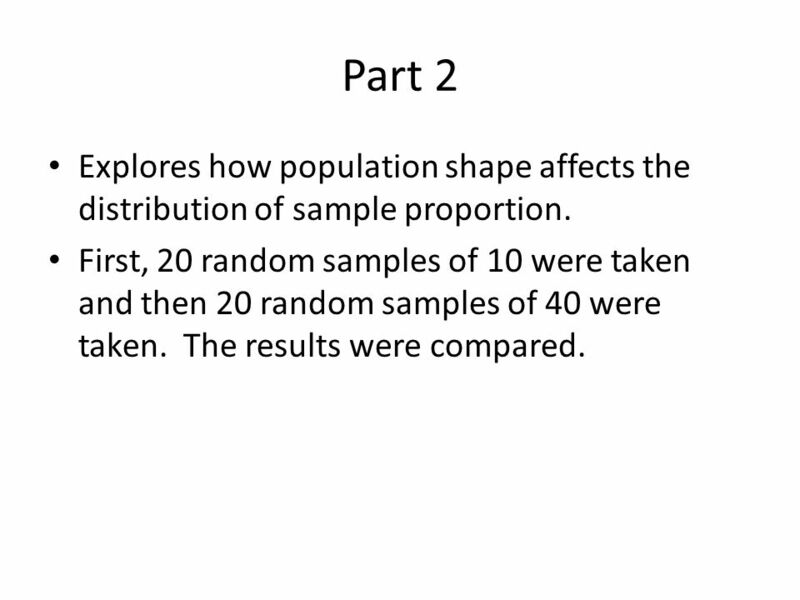 18 Part 2 Explores how population shape affects the distribution of sample proportion. First, 20 random samples of 10 were taken and then 20 random samples of 40 were taken. The results were compared. 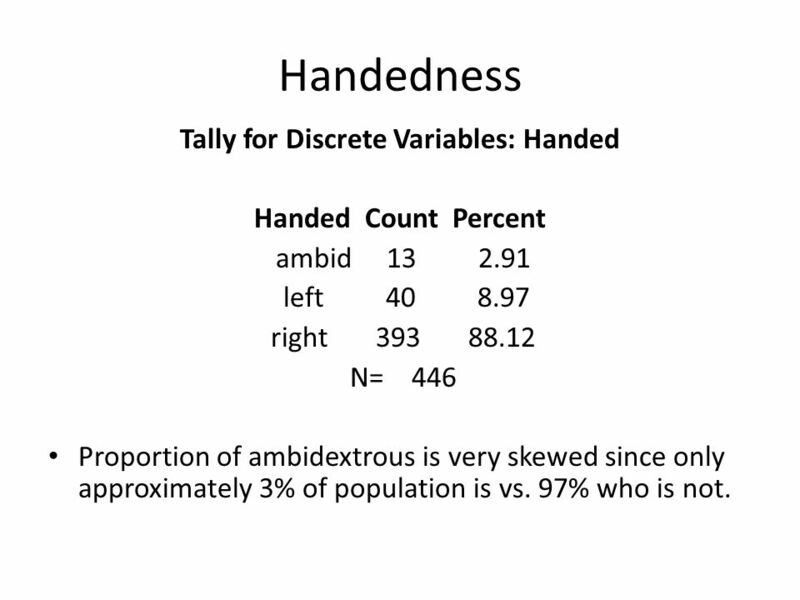 19 Handedness Tally for Discrete Variables: Handed Handed Count Percent ambid 13 2.91 left 40 8.97 right 393 88.12 N= 446 Proportion of ambidextrous is very skewed since only approximately 3% of population is vs. 97% who is not. 25 What does this mean? 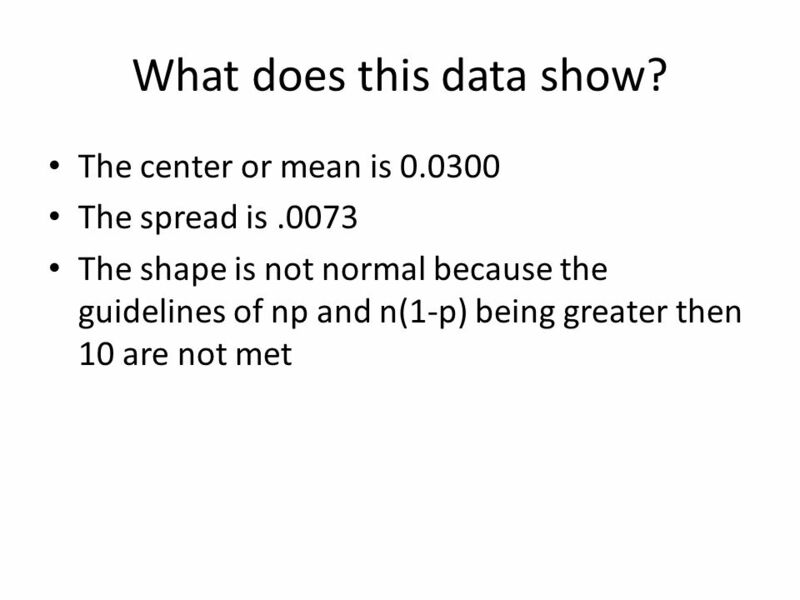 The center or mean is 0.0400 The spread is 0.02739 The shape is normal because the guidelines of np and n(1-p) being greater then 10 are met. 28 What does it mean? 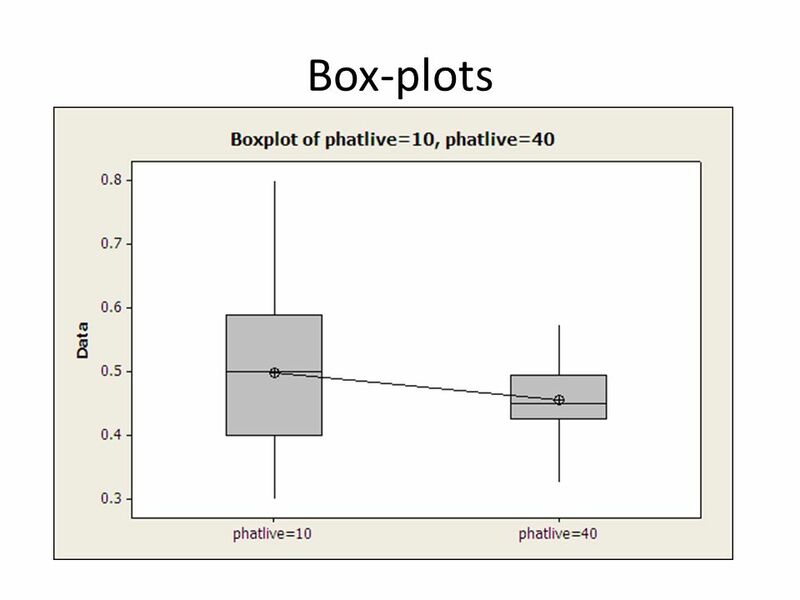 By increasing the sample size, the box plot became less skewed. There was less of a spread and fewer outliers. The center remained at approximately.03 The shape became more normal. 29 Overall Live seemed to be more normal the handedness. 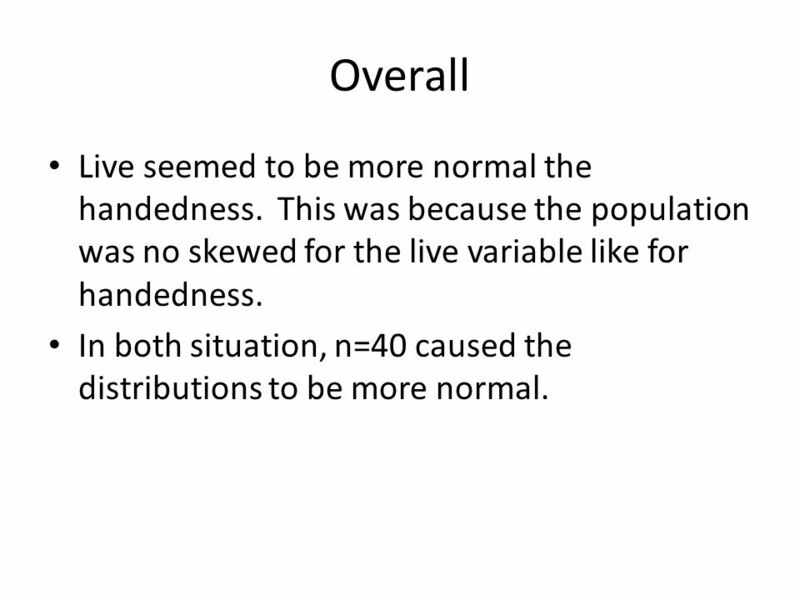 This was because the population was no skewed for the live variable like for handedness. 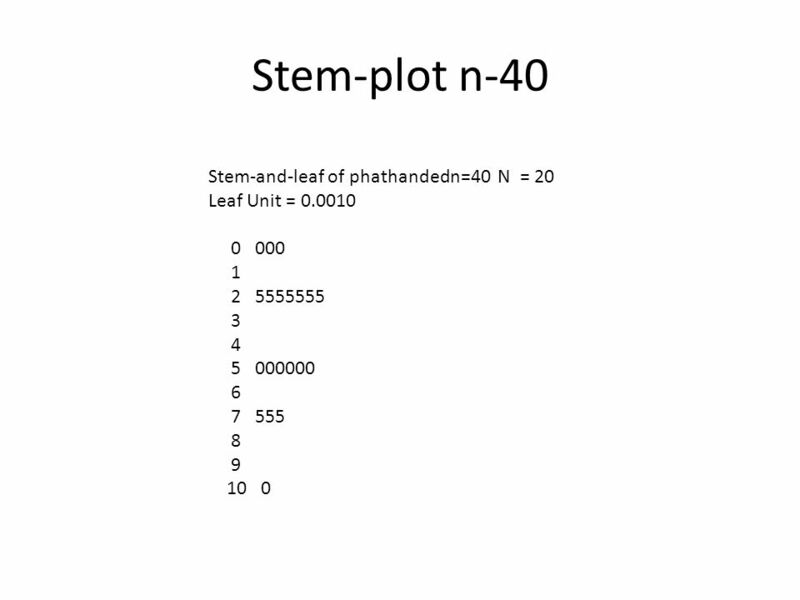 In both situation, n=40 caused the distributions to be more normal. 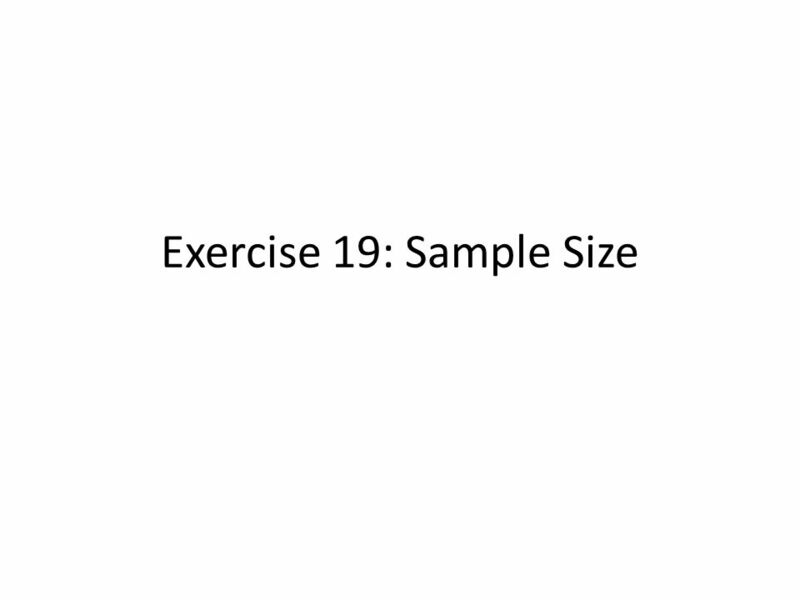 Download ppt "Exercise 19: Sample Size. Part One Explore how sample size affects the distribution of sample proportions This was achieved by first taking random samples." Sampling Distribution of a Sample Proportion Lecture 26 Sections 8.1 – 8.2 Wed, Mar 8, 2006. 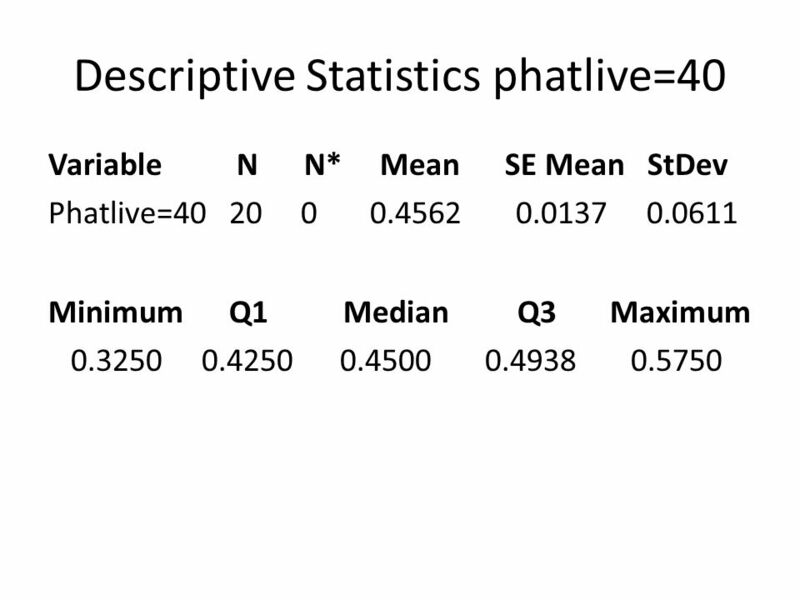 SAMPLING DISTRIBUTIONS Chapter How Likely Are the Possible Values of a Statistic? The Sampling Distribution.  These 100 seniors make up one possible sample. All seniors in Howard County make up the population. 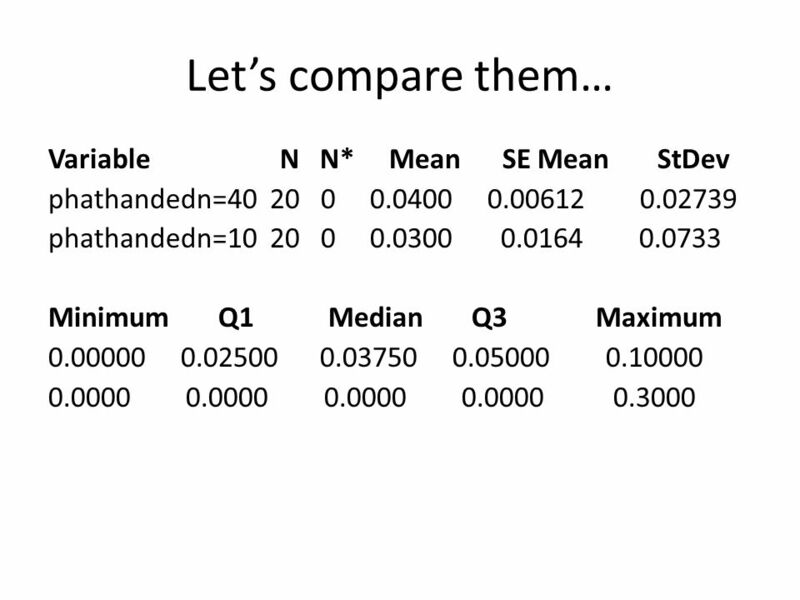  The sample mean ( ) is and the sample standard. Section 7.4 Approximating the Binomial Distribution Using the Normal Distribution HAWKES LEARNING SYSTEMS math courseware specialists Copyright © 2008. Significance Testing Chapter 13 Victor Katch Kinesiology. 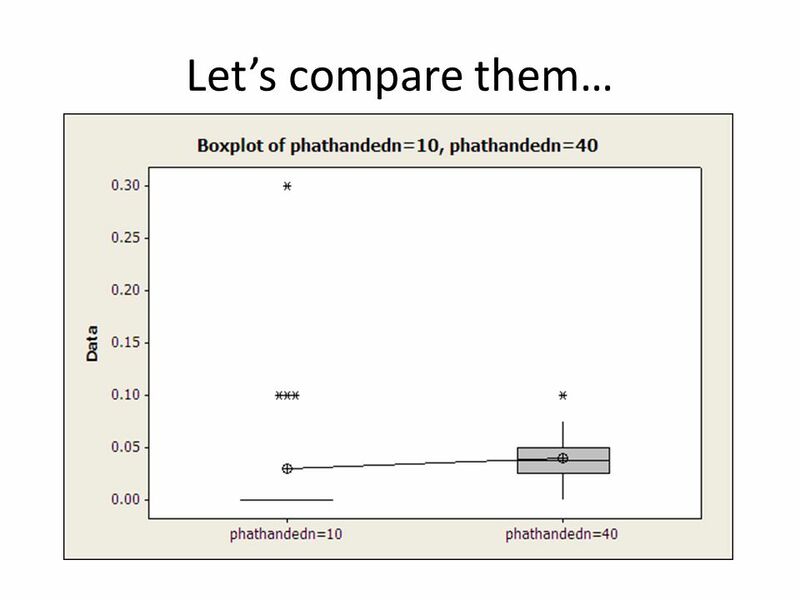 Sampling Distributions for Proportions Allow us to work with the proportion of successes rather than the actual number of successes in binomial experiments. Chapter 1 Introduction Individual: objects described by a set of data (people, animals, or things) Variable: Characteristic of an individual. It can take. Modular 13 Ch 8.1 to 8.2. 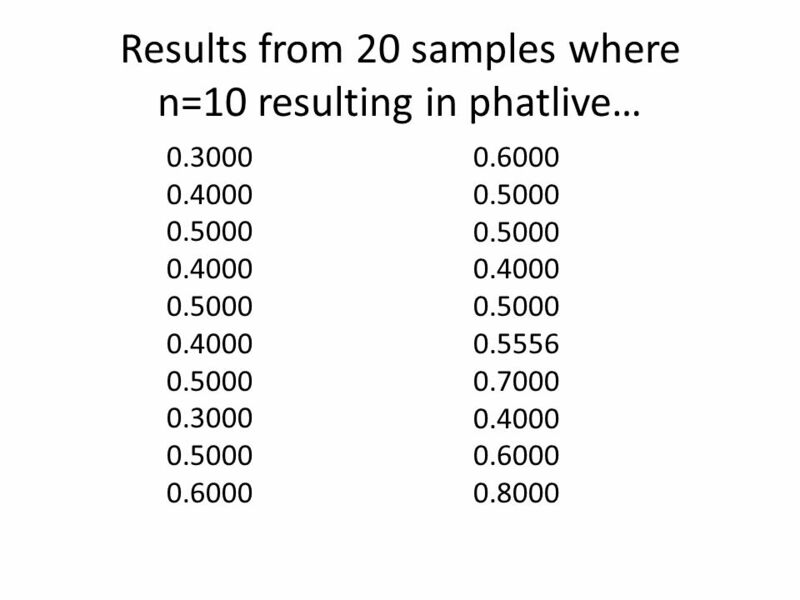 9.1 Sampling Distributions A parameter is a number that describes the population. A parameter is a fixed number, but in practice we do not know its value. Normal and Sampling Distributions A normal distribution is uniquely determined by its mean, , and variance,  2 The random variable Z = (X-  /  is. 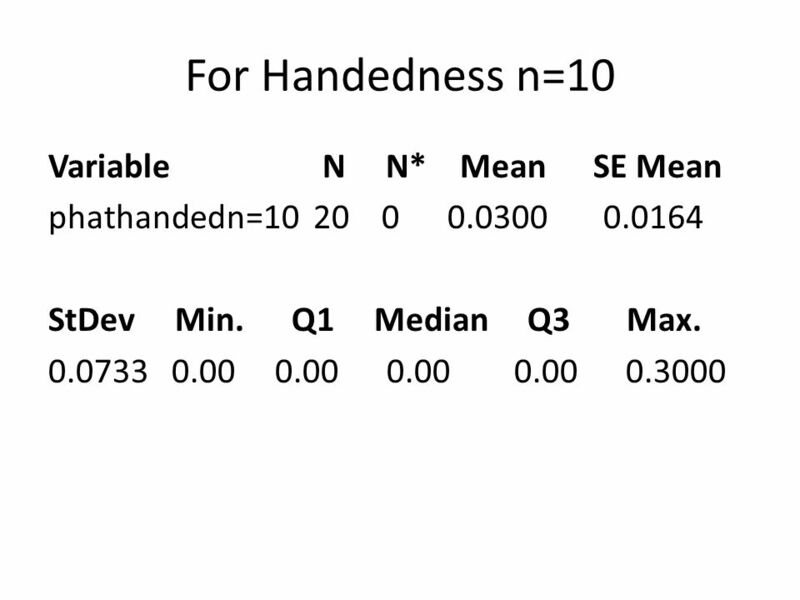 Examples of continuous probability distributions: The normal and standard normal. 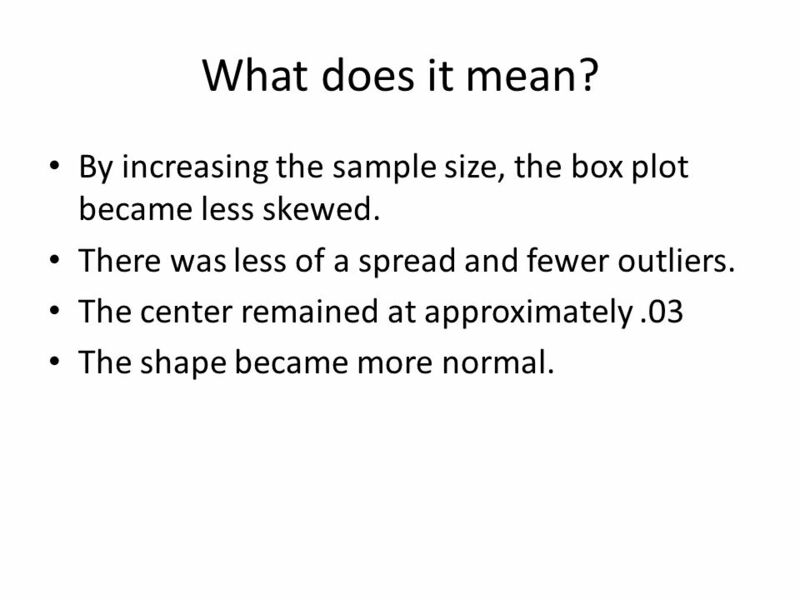 1 Chapter Seven Introduction to Sampling Distributions Section 3 Sampling Distributions for Proportions. 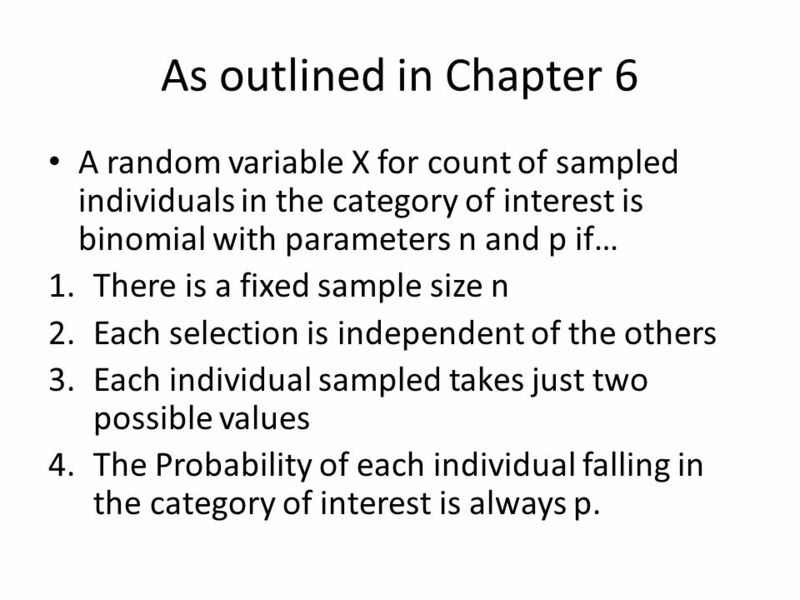 Chapter 9 Sampling Distributions Sir Naseer Shahzada.